If you want to access internet through your mobile phone via your SIM Card then you must be aware of APN ( Access Point Name). 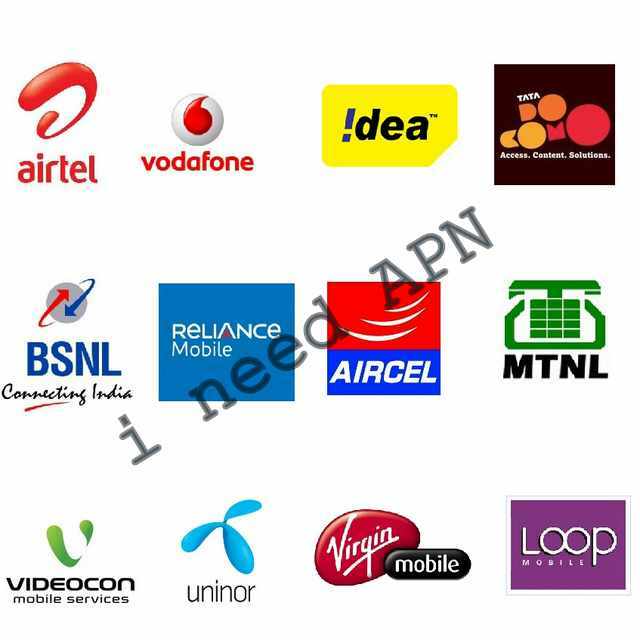 Different Operators have different APN settings for 2G Edge, GPRS, 4G LTE and 3G internet ( Airtel, Reliance, Aircel, Videocon, Tata Docomo / Indicom, BSNL, Vodafone, MTNL, Uninor). All Android smartphones, Apple iPhone, iPad, Data cards, modems, dongles, features phones and other internet capable phones requires proper APN settings for Internet Surfing, no matter whether the phone manufacturer is Allview, Amoi, Archos, AT&T, BenQ, Bird, BLU, Casio, Celkon, Dell, Ericsson, Fujitsu, Siemens, Gigabyte, Haier, HTC, i-mate, Icemobile, iNQ, Karbonn, Lava, LG, Maxwest, Micromax, Mitac, Modu, MWg, Neonode, Nokia, O2, Oppo, Palm, Pantech, Philips, Posh, Qtek, Samsung, Sewon, Siemens, Sony, Spice, Tel.Me., Thuraya, Unnecto, verykool, VK, Mobile, Wiko, XCute, XOLO, Yota, ZTE, Alcatel , Amazon, Apple, Asus, Benefon, BenQ-Siemens, BlackBerry, Bosch, Cat, Chea, Emporia, Eten, Garmin-Asus, Gionee, HP, Huawei, i-mobile, Innostream, Jolla, Kyocera, Lenovo, Maxon, Meizu, Microsoft, Mitsubishi, Motorola, NEC, NIU, Nvidia, OnePlus, Orange, Panasonic, Parla, Plum, Prestigio, Sagem, Sendo, Sharp, Sonim, Sony Ericsson, T-Mobile, Telit, Toshiba, Vertu, vivo, Vodafone, WND, Xiaomi, Yezz, YU yureka and Chinese phones or any other Android phone. We can also setup the apns manually.